No Tau army would be complete without some drones tagging along and my army has been drone-free for far too long! With a game on the horizon (woohoo!) 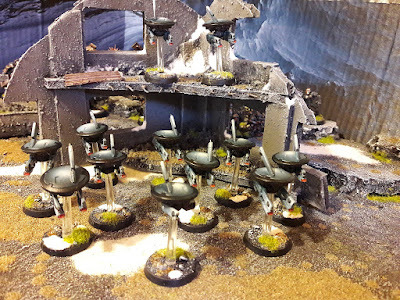 I needed to do something about that and to that end have painted up a bunch of drones to adorn my vehicles and mix things up a bit with some nasty Manta-strikes! I've said it before and I'll say it again - I'm a cheapskate, skinflint, miserly penny-pincher. For that reason you'll find that the majority of my models are reconditioned bits of other people's cast-off junk. You may even notice that - front-and-center in the photo below - is a home-made markerlight drone. It's been the best part of a month since my last post went up. I think that's the longest I've ever gone without a post. "So what's going on? Where have you been?" I hear you cry. Well, its just been busy. Work, life and all that stuff. That's not to say I've been idle on the modelling front - oh no! This has been a very exciting time for me, in fact. Because for the first time in a few years I'm actually going to get to play an actual game! I'm off to Warhammer World this coming weekend and have been prepping forces; I'm supplying both of the armies for the game. One is ready (my Astra Militarum) and the other wasn't quite there - my Tau. Now I did a LOT of of work on the Tau a couple of years back - I got most of the foot done, all of the vehicles and a Riptide. I never got around to painting any battlesuits, drones or HQ models. Obviously, I hadn't got a gaming force without them so it was time to pull my finger out and get back to it. 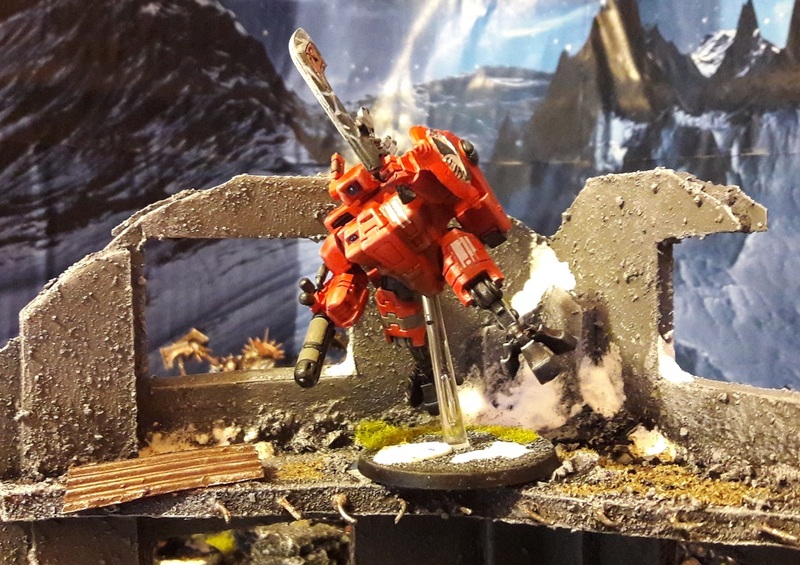 This O'Shova model is an old one - from way back when the Tau were first released. As such it's built from metal parts (shield, sword etc.) added to a standard battlesuit of that era. And they were pretty rough - almost no posability at all. I drilled a new hole in the model's groin in order to accept a flying stand (the models back then came with a small hole in the bottom of the "backpack" which meant that they appeared to be hovering in a very "square" way.